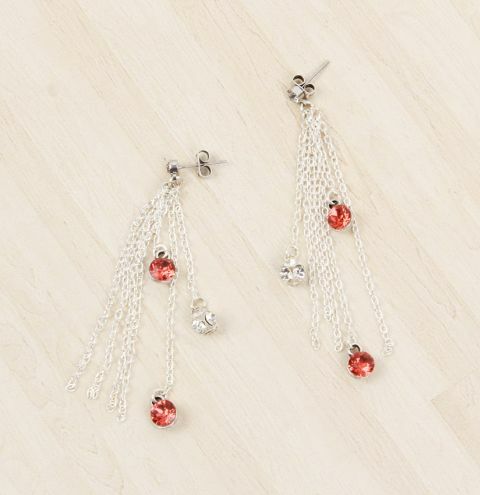 *MINI-MAKE* Make yourself a sparkly pair of tassel earrings for summer! This project was originally featured on the Beads Direct blog. To make your first earring cut some lengths of chain to the following measurements: 4x 2.5 inches long, 1x 2 inch, 1x 0.75 inches and 1x 1 inch. Attach a jumpring to the bottom loop of the earring post. Take the four pieces of 2.5 inces of chain and attach each end to a jumpring and connect the jumpring to the jumpring on the earring post. On the longest piece of chain, attach your sparkly crystal charm. Attach one of the chaton charms to the 2 inch piece of chain and another charm to the 0.75 inch piece of chain. Open a new jumpring and put your three pieces of chain with their charms onto it and attach it to the jumpring on the earring so that it sits in front of the chain. Glue the crystals into the charm settings and allow them to fully dry. Repeat these steps to make your second earring.